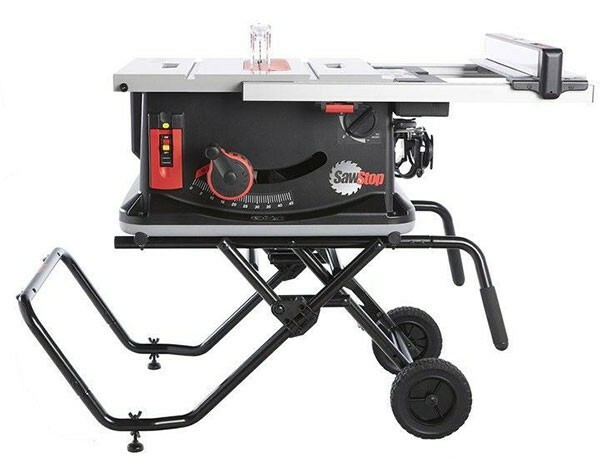 SawStop has announced that they will finally be coming out with a portable Jobsite Table Saw. While it would have been easy for them to simply make a smaller, lighter, table saw featuring their finger-saving technology, they actually added some innovative new features. Unfortunately, the Jobsite SawStop is still priced well above what most people can afford. On the jobsite speed is everything, when it takes upwards of 25 turn to raise the saw blade on other table saws, it takes only one with the newest SawStop. A new micro adjust feature allows for accurate beveled cuts and the QuickTilt feature should make those larger adjustments a breeze. At 108-pounds, the Jobsite SawStop isn’t exactly a lightweight, but the weight is a total combining the table saw and the included wheeled mobile stand. Sadly, the saw is only sold with the stand, and the price will be $1,299. In a recent interview with FineWoodworking, SawStop said their pricing reflects a premium product, but at double the price of their competitor’s high-end table saws, I am wondering how much better their saw truly is. Yes, the SawStop table saw has amazing technology that can stop a moving saw blade in a fraction of a second, thus saving body parts from being cut off, but what good is it if the masses can’t afford it? However, if you can afford it, it might just pay for itself the day your hand gets too close that that mass of spinning steel and carbide. The Jobsite SawStop will be available March 2015.